"If the Warhounds ever deploy against the zerg, it'll only be if there are enough of them left after all of the anti-insurgent operations they'll be doing all over the sector. You haven't seen the unit. It's designed for close anti-vehicle and anti-armor work, with a little bit of anti-air capability. How useful is that against the zerg? Who the hell would design a unit to fight the zerg if it has to wade into the middle of them to be useful?" The warhound is a close-in terran walker, designed from the SCV chasis. Initially an impromptu design to defend fringe colonies from bandits, the warhound would be adopted by the Terran Dominion, primarily for use against rebel terran elements. Activated through a fingerprint scanner as part of its pilot security template, and protected with light neosteel plating and a steelglass cockpit, the warhound is designed for close anti-vehicle and anti-armor work, with some anti-air capability. Their legs are designed to move over tough terrain, possessing wide and flat feet, with gimbaled toes designed for traversing many types of terrain. An onboard computer can give the pilot updates on the status of their vehicle, and the warhound is equipped with telescopics. Handholds are fixed to the vehicle, allowing the pilot to climb up and down from the cockpit. The warhound's chasis bears resemblance to that of the SCV, but unlike the SCV, the warhound's operator is contained entirely within its torso, with neural interfaces allowing the pilot to control the vehicle's limbs and armament systems. The pilot is equipped with a safety harness. "You need some advice? Shoot first, no questions." Missile racks are mounted on the warhound's shoulders, and cannon barrels are located on the end of its arms. The missile racks are capable of firing either anti-air cyclone missiles or haywire missiles, functioning as an anti-armor weapon. For close-range anti-vehicle work, the warhound possesses a railgun that fires directed plasma field-charged slugs (DPFs), which are also capable of dealing with infantry and structures, is capable of firing ammunition at 3000m / s. The warhound is capable of near-instantaneous toggling between DPF and anti-air ordnance systems, to address quickly changing threats in battlefield situations. The warhound is not effective against the zerg in that, as per it being designed for close-range anti-vehicle combat, it would have to close in on the zerg to be effective. Its feet, while adaptable when crossing over terrain, aren't designed to be effective against zerg in close combat, though a skilled operator can still kick or step on zerg ground strains. Warhounds are (or can be) equipped with neutralizer spray, which can minimize the effects of zerg acid against their structure. The concept of the warhound began with Yakov Iliev, an engineer working on a backwater planet. The mine he was working on was experiencing trouble with local bandits, and to deal with the issue, he outfitted an SCV with different armaments. When the bandits returned, they got a "surprise." Despite his actions, his employers were irate, as they had subcontracted security out, and his actions made them look bad. Before they could fire him. however, the Axiom Corporation bought out the company. Iilev's plans and designs for the modified SCV were included in the purchase. Years later, Iilev was stated to have retired, but Ottmar Drenthe suspected that he had been forced out and his designs stolen under the pretext of some fine print in the acquisitions agreement. The warhound was developed after the first phase of the Second Great War after analysis of the battles fought, in order to better improve the terran war machine. It was developed by Axiom Corporation, and prototypes were produced on Bukari V. The test was successful, in as much that the warhounds were able to display their firepower. Unfortunately for Axiom, the disgruntled workers turned their vehicles on the factory complex. They were then deployed to high security installations. The warhound saw action in the Second Great War on both Char and Korhal, where it was fielded against the zerg in both cases. During the conflict, Project Blackstone conducted work on the warhound. Engineer Red Quinton stripped out the pilot security template to allow for quicker construction and an overall boost in power. Dr Daniel Rothfuss pointed out that this act "left the keys in the ignition." Quinton responded that the zerg and protoss either could not, or would not pilot the warhound. The modifications were submitted to Axiom. They were not incorporated. Sometime after the ascension of Valerian Mengsk, a rumor spread among the Dominion Marine Corps that a shipment of warhounds was captured by the protoss and zerg, but that the two races then used them for mining. Warhounds were fielded by Moebius Corps during the End War, and were deployed in defense of one of their hybrid-breeding facilities, as well as during their raid on Ulnar. Later, the Defenders of Man utilized warhounds during their rebellion against the Dominion. The Terran Dominion continued to field warhounds as part of their standing forces well into 2512. The warhound's unit portrait depicts a surly military commander figure—akin to a younger, more toned-down version of the battlecruiser's unit portrait. The suit and the cockpit interior strongly resemble goliaths. The warhound also has the ability to dance. The warhound is a campaign-only anti-mechanical unit used in the Heart of the Swarm, Legacy of the Void, and Nova Covert Ops campaigns. The warhound is equipped with powerful long-range haywire missiles which deal 30 damage to mechanical units. The ability is autocast. These missiles are in addition to its regular anti-ground attack. Increases the attack damage of terran vehicles. Sirius, a heroic outlaw warhound, is available for Tychus Findlay in Co-op Missions. He can spawn warhound turrets. The following section contains information from a previous version of StarCraft II: Heart of the Swarm which is no longer valid. 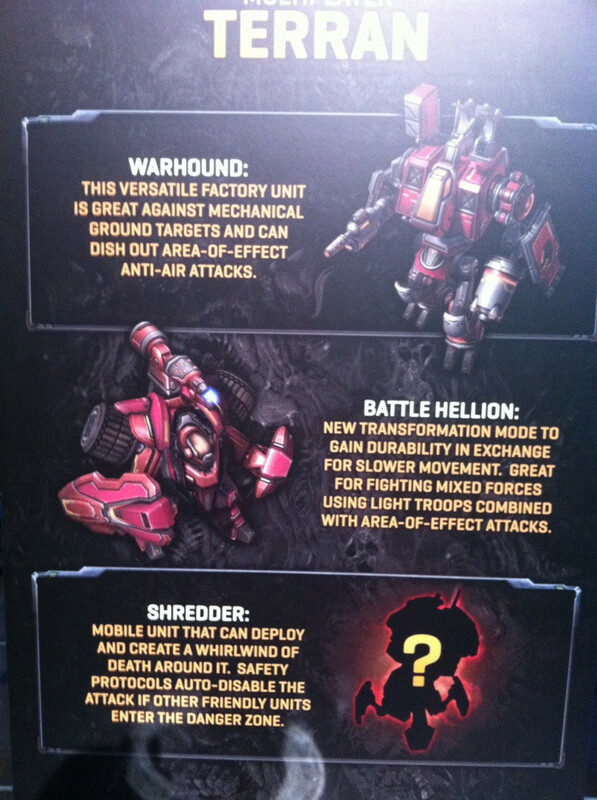 The warhound is an anti-mechanical unit that was originally supposed to be available in skirmish games. It was expected to be a core unit in terran vs. protoss games due to the latter faction's reliance on mechanical units. It was of limited use against the zerg however due to their complete lack of mechanical units. It did not have an anti-air attack. The warhound was originally called the "merc commander." It originally did splash damage to air targets. The rationale behind the missiles was to provide a new dynamic in terran vs. terran multiplayer games, in order to make it easier for players to break siege tank lines. As of June 2012, the development team was looking to find a way to make the warhound useful in terran vs. zerg matches. However, as of September 2012, the warhound has been completely removed from the game. The development team originally did not clearly state whether the warhound would return later in the beta, but as of March 2013, with the closing of the beta, it has been permanently removed from multiplayer but was eventually used in the campaign. Like the hydralisk and the roach, the warhound had a different attack animation for melee range; it punched targets with its shield arm. The warhound the subject of Blizzard's April Fool's joke in 2013, where it replaced the workers of all three races. The warhound's dance is based off the Charleston. The animations for said dance were done by Lana Bachynski. ↑ 1.0 1.1 1.2 1.3 1.4 1.5 1.6 1.7 Irvine, Alex. "Command Performance." (March 28, 2013). Blizzard Entertainment. StarCraft Lore: Command Performance Accessed 2013-03-28. ↑ 3.0 3.1 3.2 3.3 Barba, Rick. StarCraft Field Manual (hardcover). Insight Editions, November 17, 2015. ↑ 4.0 4.1 4.2 4.3 4.4 Zahn, Timothy (November 8, 2016). StarCraft: Evolution. Del Rey Books. ISBN 0425284735. ↑ 5.0 5.1 5.2 5.3 5.4 KDraconis. 2012-06-08. Heart of the Swarm Unit Stats. StarCraft Legacy. Accessed 2012-06-09. ↑ Blizzard Entertainment. StarCraft II: Heart of the Swarm. (Activision Blizzard). PC. Mission: Heart of the Swarm, Old Soldiers (in English). 2013-03-12. ↑ Blizzard Entertainment. StarCraft II: Heart of the Swarm. (Activision Blizzard). PC. Mission: Heart of the Swarm, The Reckoning (in English). 2013-03-12. ↑ Blizzard Entertainment. StarCraft II: Legacy of the Void. (Activision Blizzard). PC. Mission: Whispers of Oblivion, Dark Whispers (in English). 2015-07-15. ↑ Blizzard Entertainment. StarCraft II: Legacy of the Void. (Activision Blizzard). PC. Mission: Legacy of the Void, The Infinite Cycle (in English). 2015-11-10. ↑ The Rusher. 2011-10-26. ​A complete list of all multiplayer HOTS changes/additions, now that Blizzcon is over. Reddit. Accessed 2011-10-29. ↑ Blizzard Entertainment, Teamliquid. 2012-06-09. Heart of the Swarm Update. Blizzard Entertainment. Accessed 2012-06-09. ↑ Raiderrobert. 2012-09-05. Summary of HOTS Changes. Reddit. Accessed 2012-09-09. ↑ Blizzard Entertainment. Co-op Missions. (Activision Blizzard). PC. Tychus Findlay (in English). 2018. ↑ Dustin Browder. 2012-04-11. Developer Update: Heart of the Swarm Multiplayer - Starcraft II. Battle.net, accessed on 2012-04-11.